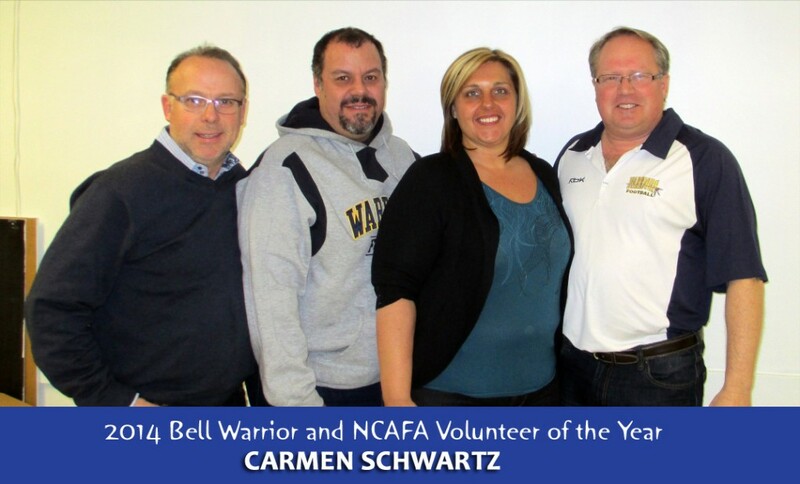 Carmen Schwartz (Bell Warriors VP of Administration) was just named 2014 NCAFA Volunteer of the Year. The Warriors introduced a Bell Warrior Volunteer of the Year 3 years ago. Nominations can be made to the President of the Bell Warriors at president@bellwarriors.ca. When more than one nomination is received before the nomination deadline, a committee is established to weigh the applications to arrive at a winner. Our 1st winner in 2012 was Makayla Statham. Last year’s winner, Karin Statham (Warriors Director of Canteens), was our 1st Bell Warrior to win the NCAFA Volunteer of the Year and this year’s Warrior Volunteer of the Year – Carmen Schwartz – is now the Warriors 2nd NCAFA Volunteer of the Year. For more details about Carmen’s many accomplishments and tireless, selfless dedication to our league, supporters and players, read NCAFA Volunteer of the Year Nomination Letter 2014 – Carmen Schwartz. CONGRATULATIONS CARMEN & THANK YOU! The Bell Warriors play in the largest amateur football league in Canada – the National Capital Amateur Football Association (NCAFA). The NCAFA Championships will all be played at Minto Field starting tonight with the Tyke (ages 8-10) Sullivan Championship which will pit the Bell Warriors vs the East Ottawa Generals. The Tykes won a thrilling come-from-behind 33-30 win Sunday night to earn their spot in the Championship. The Warriors Bantams play Saturday vs the Mustangs which will be followed on Sunday by the Warriors Mosquito and Pee Wee Clubs. “At the Mosquito level, 1st-time head coach Richard Baylin will be leading his undefeated Mosquito squad vs the undefeated Cumberland Panthers. This came about due to a phenomenal double OT 28-22 win over a dynamic North Gloucester Giants team. The final matchup of the best from the West facing the best from the East will be sure to be a thriller. Following the Mosquito final, the Warriors Pee Wees will also be facing the Cumberland Panthers. The Warriors Pee Wees will be led by aggressive defensive leaders Steven Schwartz (Nepean) and Malik Yusef (Stittsville) while offensively, QB James Keenan (Stittsville) will be steering a well-rounded offensive attack. The speedy RB Andrew Fullerton (Stittsville) will be supported by WR’s Eric Conley (Nepean), Josh Streng (Carleton Place) and Nicholas Walter (Stittsville). The Warriors are very proud of what we have accomplished this year and having all four of our teams competing in the Regional NCAFA Championships should make for one exciting week of football for our Warriors supporters, families and players”, concludes Paul Stewart. The Bell Warriors Football Club stands for RESPECT-RESPONSIBILITY-DIGNITY-FITNESS-GENEROUSITY-LEADERSHIP. Since 1955, the Bell Warriors Football Club has offered football programs for boys and girls ages 8-16 in the communities of Britannia, Bayshore, Bells Corners, Richmond, Munster and Stittsville. For more details on how you or your business can show your support for the Bell Warriors Football Club, go to the Sponsorship Opportunities page at www.bellwarriors.ca or email president@bellwarriors.ca. 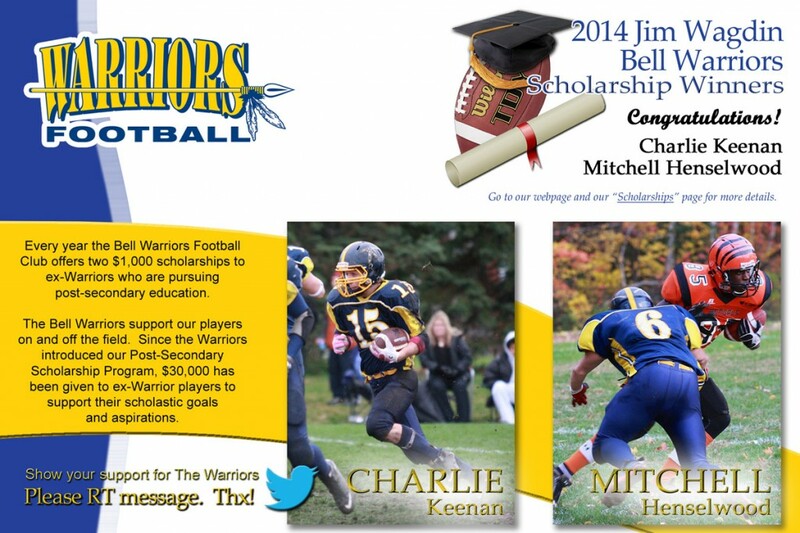 In 1999, the Bell Warriors Football Club introduced a Post-Secondary Scholarship Program which is now known as the Bell Warriors Jim Wagdin Scholarship Program. Jim Wagdin was a coach with the Bell Warriors for 24 years and retired from the club as President in 2012. His commitment to the Warriors and his community reflect the values the Warriors want to reinforce in our players with this post-secondary scholarship program. Every year since, the Warriors have given up to two $1,000 scholarships. The three main selection criteria are Athletic experience, Academic achievement, and Community volunteerism. This year’s two winners are two young men that were both stellar players with the Warriors: Charlie Keenan and Mitchell Henselwood. In all, the Warriors have given out $30,000 to ex-Warrior players in support of their scholastic goals and aspirations. On and off the field, the Warriors stand by our players and believe in giving back to our community. More details can be found on our Scholarship Page.